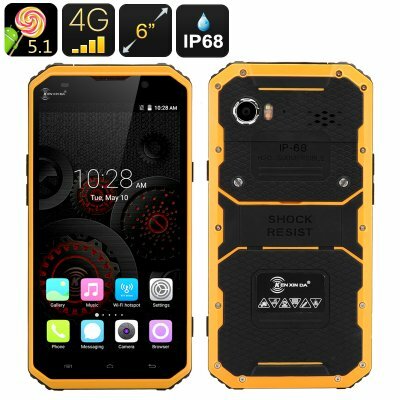 Successfully Added HK Warehouse KEN XIN DA PROOFINGS W9 Rugged Smartphone - 6 Inch FHD Screen, IP68, Dual SIM, 4G, Gesture Sensing (Yellow) to your Shopping Cart. The KEN XIN DA PROOFINGS W9 is a rugged smartphone with great features: a 6 inch HD screen, Android 5.1, 4G connectivity on two SIM cards and more. Enjoy the best of Android with the rugged waterproof smartphone sporting Android 5.1 and Play Store access. All your media, apps and games will feel right at home on the large 6 inch HD screen. Moreover, you will have Gesture Sensing for quick and efficient navigation, letting you skip music tracks, switch between apps and more with just a wave of the hand. The KEN XIN DA PROOFINGS W9 supports the use of two SIM cards simultaneously and covers a wide range of networks: 2G(GSM 850/900/1800/1900/2100MHz), 3G (WCDMA 850/900/1900/2100MHz) and 4G (FDD 800/1800/2600MHz, B1/B3/B7/B20). You will get up to 6 hours of uninterrupted talk time + 120 hours on standby with the 4000mAh battery. With the IP68 rating, you get yourself a truly tough rugged smartphone that is resistant to the elements: it’s shockproof, dustproof and can even be submerged in water. Thanks to 16GB of internal memory + 32GB externally, you will have plenty of storage space to load up on apps and media files and Bluetooth 4.0 ensures efficient data exchange with other devices with Bluetooth support. The KEN XIN DA PROOFINGS W9 comes with a sturdy build, efficient connectivity and fast web speed, a beautiful 6 inch full HD display and waterproof rating - all for a very reasonable price. The KEN XIN DA PROOFINGS W9 Smartphone comes with a 12 months warranty, brought to you by the leader in electronic devices as well as wholesale Android phones.